Mayor Miro Weinberger said a reduced number of refugees will be moving to Burlington in the coming months, and that the change isn't good for the city. During his State of the City address Monday, he said Burlington will welcome just 15 refugees by September. 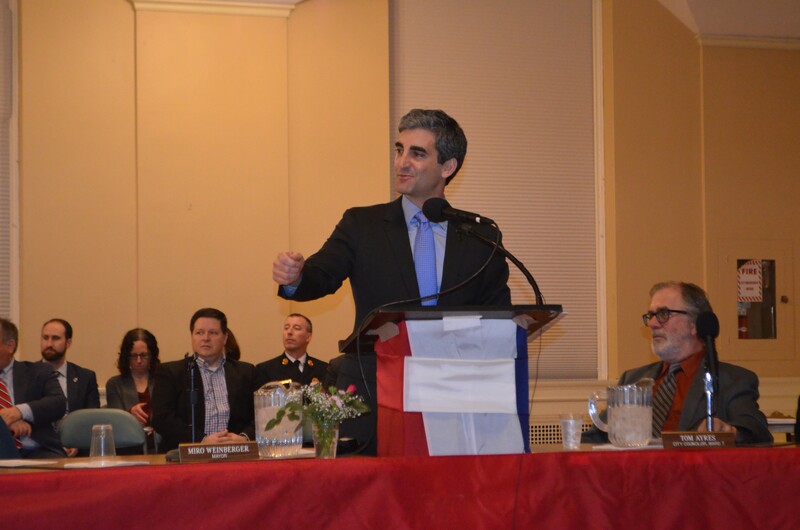 "For more than 30 years, Burlington has welcomed approximately 300 New Americans each year — immigration that has made us much more diverse and culturally rich, and has been part of Chittenden County's economic success," Weinberger told the city council and about 100 residents who filled the seats at Burlington City Hall Auditorium. He blamed the policies of President Donald Trump for the change. But Weinberger vowed to keep Burlington advancing forward. He introduced a young Sudanese couple, Samya and Salah, who were reunited in February when Samya was able to come to America and join Salah, after Trump's travel ban was lifted. "At a time when the federal government is trying to close doors and turn its back on our most pressing challenges, we here in Burlington must continue to work harder than ever to keep our doors open, and to keep advancing," he said. Weinberger, who is starting his sixth year in office, outlined his plans for the future. He announced that the city would invest in five major areas in the coming year: public spaces, alternative transportation, roads and sidewalks, public safety, and shrinking the city's environmental footprint. The administration will continue to invest in the city's infrastructure, increasing spending on sidewalks and roadways, opening a new public park and presenting a walk-bike master plan, he said. Weinberger also announced plans to invest in utility-scale energy storage, add electric vehicle charging stations and bring electric buses to Burlington. He announced a plan to increase investment in public safety by hiring three additional police officers and three firefighters in the coming year. The initiative would allow for increased street patrols by police and would make the city less reliant on overtime for firefighters. He pledged to push for an initiative for a regional dispatch system that would appear on the ballot next Town Meeting Day. Weinberger also pledged to continue efforts to fight the opioid problem, calling it "the public health crisis of our time." Weinberger touted his achievements during his first five years in office: improved public finances, a growing downtown and major investment in addressing opioids. He made no specific mention of the Burlington Town Center redevelopment project, which has consumed much of his political energy in the past year. But he alluded to a conciliatory approach to the project's vocal opponents. "I know that some Burlingtonians also have questions about the changes we are pursuing, as well as the pace of change," he said. "While change is inevitable no matter what we do, it is important that we listen carefully to these voices of concern." Again and again, Weinberger painted the city as working to advance in the face of a "retreating federal government." Aside from the refugee issue, he mentioned a lack of commitment to addressing climate change. "At a time when the federal government is trying to close doors and turn its back on our most pressing challenges, we here in Burlington must continue to work harder than ever to keep our doors open, and to keep advancing," he said. He added: "We have a long history of municipal activism that has us punching far above the weight class of a 42,000-person city." The rest of the evening posed no surprises. Jane Knodell (P-Central District) was unanimously elected council president. She told Seven Days last Friday that she had secured the seat. As she accepted the nomination, Knodell announced that she would forge a relationship with the administration that is "not adversarial, but also not a rubber stamp." The council reappointed the existing board of finance, which oversees the city's financial decisions. Karen Paul (D-Ward 6 ), Sharon Bushor (I-Ward 1 ), Kurt Wright (R-Ward 4) and Knodell will represent each party, and Weinberger will take the fifth seat. Newly elected councilor Richard Deane (D-East District), and incumbents Knodell, Joan Shannon (D-South District) and Dave Hartnett (D-North District) were sworn in for new terms.